"After I finished Birth of the Firebringer, about all I knew about what was going to happen in Volumes 2 and 3 of the trilogy was that in Volume 2 (Dark Moon) the hero, Jan, would become separated from unicorn herd and spend some time in a human city, observing how two-foots (humans) wield and manipulate fire, and that in Volume 3 (The Son of Summer Stars), there would be a huge battle between the unicorns and their ancestral enemies, the wyverns. I also knew that the gryphons would switch sides at some point, becoming allies of the unicorns, but had no idea how or why. It all worked out in the end. Writing a story, for me at least, is an extended exercise in problem-solving. I carry on mental conversations with myself, along the lines of: Here's where Book 1 ended. Here's where I want Book 3 to wind up. Now, how am I going to get there?" Son of the Summer Stars, last in the trilogy, was released in hardcover in 1996. By 2001, however, all three books were out of print and hard to find. In 2003, Firebird Books reintroduced all three in paperback with brand new cover art by Justin Sweet. 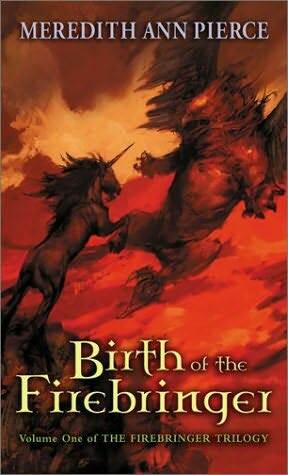 Birth of the Firebringer tells of Jan's initation into the Ring of Warriors via the unicorns' annual pilgrimage to the Mere of the Moon and also of his re-birth as Alm'harat's prophesied Firebringer and of the start of his relationship with Tek; the book also hints at the events that will soon plunge Korr (the unicorn's prince and later king) into madness and tyranny. Dark Moon takes up the story a year after Jan's accession as prince and tells of his mating with Tek and how, due to a gryphon's attack, he is swept out two a land of two-foots where he discovers fire. Meanwhile, at home in the vale, with Jan given up for dead, Korr's madness wreaks havoc and allows starvation to decimate the herd. Due to Korr's venomous threats to her, Tek is forced to flee to her mother where her and Jan's offspring are born before events in the vale overthrow Korr and allow Tek to return home. Jan escapes and is reunited with Tek.